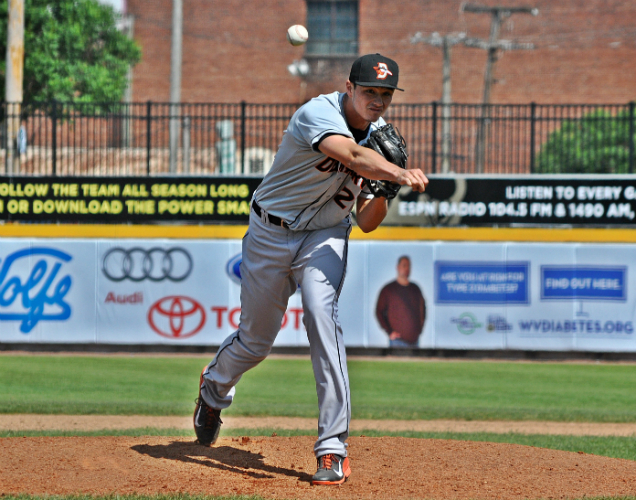 Before being selected by the Baltimore Orioles in the 2013 MLB draft, Dylan Rheault began his ascent to the professional ranks on the fields of Ontario and Michigan. During his time growing up in Canada, Rheault learned his love of the game from his dad. Before being selected by the Baltimore Orioles in the 2013 MLB draft, Dylan Rheault began his ascent to the professional ranks on the fields of Ontario and Michigan. During his time growing up in Canada, Rheault learned his love of the game from his dad. Growing up, Tony Rheault coached his son and taught him the ins and outs of the game of baseball. Rheault would go on to play baseball for the Sudbury Hitmen, a club team located near his hometown of Garson. After a few seasons with the Hitmen, the Rheault family made the decision for him to relocate to Michigan, where his mom resides. In Michigan, Rheault could further his development as a baseball player and played his final two years of high school at Glenbard South. As a senior, Rheault went 6-3 and pitched 4 complete games. In 60 innings of work, he struck out 78 batters and made the commitment to continue his baseball career at Central Michigan. Enrolling at Central Michigan in 2011, Rheault would not see official game action during his first year, as the team opted to red shirt the right-hander. Things would be different for Rheault during the 2012 season, as the Chippewa’s would sent him to the mound 17 times, including two as a starter. As a reliever, Rheault was called upon to pitch multiple innings, finishing the season with just over 40 innings pitched. While he averaged 9.7 strikeouts per nine innings of work, Rheault also struggled with control, averaging 8.63 walks per nine innings in his first season of college baseball. The Central Michigan baseball team would use Rheault in a similar role in 2013. The tall right-hander started four games and came out of the pen in ten others, once again pitching 40 innings. Over the course of the season he finished with a 1-4 record and an ERA of 6.07. Even though his numbers didn’t stand out, scouts liked Rheault’s potential. Standing at 6’9 and still refining his pitches, scouts saw the potential that Rheault could bring to an organization. In the 19th round of the 2013 draft, Rheault’s phone rang, it was the Baltimore Orioles calling to congratulate him on being drafted into the Orioles organization. Rheault would have a tough decision to make regarding his baseball future. He could return for his third season at Central Michigan and continue to learn and refine his game or he could learn from the Baltimore coaches and instructors at the professional level. After days of deliberation, Rheault opted to forgo the rest of his college career and on June 19th he signed his first professional contract. The Orioles did not waste any time getting Rheault his first taste of professional action assigning him to the Aberdeen Ironbirds in the New York/Penn League. The Ironbirds used Rheault in similar fashion as Central Michigan did. He started in four games and pitched in relief in nine, accumulating another 40 innings of work. While his strike out rate dipped to 6.3/9 his walk rate also reduced dramatically to 3.6/9. As the season came to an end, the product of Ontario went 1-3 with a 3.57 ERA. To start the 2014 season the Orioles promoted Rheault to the Delmarva Shorebirds of the South Atlantic League. In his first full season with the Shorebirds he has appeared exclusively out of the bullpen and has done so with great success. In 11 appearances he has already amassed a 6-0 record to go along with 2 saves and an ERA of 1.57. Rheault has had success throwing his sinker as he continues to work on refining his change-up. He also has been able to lower his walk rate while also seeing a spike in his swings and misses. As the 2014 season continues, Rheault hopes to build upon his early season success and he makes his way through his first full season of professional baseball. We will continue to follow Dylan’s progress all season long. Be sure to follow him on twitter @DRheault and follow us at @CTD_Sypien as we will provide updates on Dylan all season long. It was one of the greatest feelings in the world. It had been a dream of mine since I was a little kid. On draft day I was just at home hanging out and then I actually left in about the 15th round and was heading to the zoo. That’s when the Orioles called and let me know that they selected me. 2. Your baseball development was split between growing up in Ontario and Michigan. What would you say the differences are between the baseball development programs in the United States and Canada? There is a huge difference. I was from way up in Northern Canada and when I was coming up everything was kinda just put together. Baseball in Canada has gotten better since then but at the time most of the coaches didn’t have a lot of baseball or coaching experience. My Dad coached me and we would just try to find places to play. We had a travel team that would go all over Ontario. It was not as competitive either, there were some really good players but they are spread out. Once I came to the United States, I noticed the talent was a lot better. I had to adapt to play and think quicker. I have a low three-quarter delivery and I throw a sinker as my main pitch. I also throw two off-speed pitches, I slider and a change-up. I pitch mostly off my sinker, at 6’9 I have a pretty good downward angle with the pitch. The slider and the change-up are developing, I working on those with the pitching coaches here. 4. Last season with Aberdeen you saw time both as a starter and a reliever. Do you have a preference? I don’t really have a preference, I just want to pitch to be honest. I have grown accustomed to the bullpen this year. I like the adrenaline rush that you get when your named called. 5. This season you have been really successful coming out of the bullpen already picking up six wins. What has driven all your success this year? This is my second year with pitching coach Alan Mills and he has honestly been on of the biggest influences on my career to this point. He has helped with the mental side of things. I’ve always had pretty good stuff but I haven’t always trusted it. I just try to go out there now and pitch and not worry about anything. It’s really all about trusting my stuff. 6. You obviously just mentioned Alan Mills so you may have answered this one but is there any particular coach or instructor along the way that has helped you get to this point in your career? There has definitely been two. My pitching coach at Central Michigan, Jeff Opalewski played a huge roll in my conditioning and development. He really got me going physically and then as I said before Alan Mills has really helped on the mental side. He had a successful big league career and he brings an attitude that is great for pitchers to learn from. 7. As a young pitcher in the Orioles organization is there anything the coaches and instructors try to teach at the lower levels of the system? They haven’t done too much mechanically just tried to clean things up. They are big on pitch development and working down in the zone. Since I throw a lot of sinkers that is what my game plan is throwing the ball down and hitting my spots. 1. Who would you say is the biggest prankster on the Shorebirds? That’s a tough one. I’d say the entire Shorebird bullpen. It seems like we are always pulling pranks on people and messing around with everyone on the team. Sometimes it gets boring down there and we start messing around. 2. Who was your favorite baseball player growing up and why? Derek Jeter – Ever since I was little, my dad was a Yankees fan, I always watched him growing up and respected how he played the game. To think about how long he has played and how well he has done up until now is amazing. 3. If you could have dinner with one person (Dead or Alive) who would It be? I’d have to go with Derek Jeter, I idolized him growing up and I think it would be an awesome experience to sit down and pick his brain. It would be cool to hear about everything he has seen and everything he has done. A special thanks to Dylan Rheault for taking some time out of his busy in season schedule to chat with us. We look forward to following him all season long and into the future. Please remember to give him a follow on twitter @DRheault and like Chasing MLB Dreams on Facebook and follow us on twitter @CTD_Sypien as we continue to feature and follow all of our featured players as they chase their way to the major leagues.